Outrageous and appalling. Not much more to be said. If god wants the kid to call the kids help phone, he'll burn the number into a piece of toast of something. WOW! I'll make no judgement on religion here. That is pure and simple terrible, TERRIBLE advice. Someone needs to stick a Kids Help Line phone number on that ad ASAP. Lets hope its taken down off the TTC, that kind of nonsense can do more harm than good. Praying - making people feel good without having to do anything for over 2000 years. I agree, whatever your religious views are, that's horrible advice....I think even the most devout bible belt christian would agree that if a childs parents are abusing drugs, the police could help a lot more than God! But I disagree with taking this type of ad down, for one reason only. It seems that as each day goes by, us atheist types have to do less and less. These delusional religious folk are doing a great job proving our points to the masses without our help. Religion preys (pun intended. )on the delusionals' bank account. Is the TTC this desperate for revenue? I always that their ads were to be non partisan? I agree. Take it down. It's bad advice. call them and tell them what you think of the ad. Can the TTC turn down an ad though? Why do atheists think they are so 'cool' and always right? It's a weird ad alright. But allow me to point out a couple things: The "kid" in this ad is not seeking advice from anyone - he's already praying about his predicament. Secondly, how many of you actually believe a real kid in this situation is going to be riding the TTC alone, look up and see this ad and think to himself, "Problem solved?" I mean honestly, give your kids some credit and stop being so hysterical. @Handsome Rob - yes they can. They turned down an Ashley Madison promotion on their streetcars. we think we're so cool because we're all issued Fonzie jackets at birth. I know - it's a bit weird. I don't really understand it either, but i've just come to accept it. Though I have no problem with the bible verse quoted, I do believe that its not what should be quoted in this case. They should focus on praying for the people involved (parents, etc). Icarus - It's really too bad that you've never experienced the power pray. As an alternative I was given a pair of Aviator Ray-Bans and rapier sharp wit. The 'its just been revoked' line from Lethal Weapon...I wrote that. Sorry Mike, but this is just another thinly-veiled attack on religion, and as hollow as your "In God We Trust" posting. Just to expand on my earlier comment, the root of this post is not really about being concerned for the welfare of all these hypothetical children with drug abusing parents happening across this ad while riding the TTC, is it? The real reason for this post is that atheists are offended when they see a message promoting Christianity or the Bible. So in typical fashion, the first reaction is "Pull the ad!". It's really no different than the politically correct, uptight nincompoops that forced the TTC to pull the Argo ads last year ("Home is where the heart is. It's also where we hurt people. "), or forced the removal of the "Goon" movie poster. Why is it the most seemingly liberal, socially progressive people are the first to want to muzzle free speech when confronted by a message they personally don't like? Whoops. The comment above is mine. You're missing the point. This isn't an attack on religion but an attack on an bad ad. This makes religion look bad. Do you really agree with the advice? It should read "Report them and then pray for their well-being". 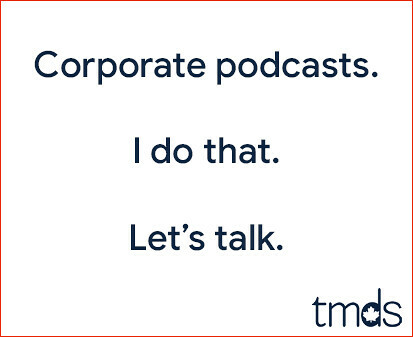 That would be a better ad. I am not saying the ad should be pulled but the people that produced it should take a second look and realise how poor and irresponsible the advice is. I think it's most of you who are missing the point. I agree, this is clearly not the best executed ad, but it is not intended to be advice. I checked out their website - they have about 150 other panels with different messages, but the intent seems to be to challenge "...the reader to think about what they have read by posing thoughtful, searching questions." They're not attempting to provide advice to specific issues. 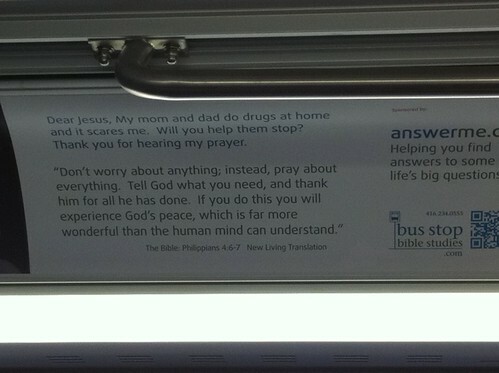 Oh, and there is apparently an Atheist Bus Campaign to counter these ads. I wasn't trying to slag religion with this post, merely sharing that I thought it was awful advice. How to deal with drug addicted parents is "thoughtful, searching questions?" And don't assume I would support seeing Atheist group messages either. I think anyone that needs to have an advertising campaign to slag on religion is pathetic. But this particular ad was just plain wrong. I used to think those Later Day Saints ads on TV were great. "Mr Sullivan! Mr. Sullivan! I broke your window! I've got to confess!" That was a religous ad and I thought it was great. Good advice. Anonymous thinks athiests should show due respect to his belief that humankind was saved by the torturing to death of a man that was his own father so that we could be saved from the judgement that his father would show us. IMHO think athiests and anti-theists do this brilliantly. The parts of christianity that are useful are those that could be described as humanism. The rest is dogma. Not faith. Dogma. Unfortunately "bad ads" will mostly likely be the norm for an expanded transit system...that's where the money is. I would also look for the return of Ashley Madison and other "questionable" ads from other companies/industries. @ Icarus - since I was the only one that posted as Anonymous (see posting right below that one) I assume you' re addressing me. You happen to have made a bad assumption and stereotyped me without me ever have stating what my beliefs are. Interesting. Scared of violence in your life? Don't worry, just pray on it. And if no one helps you when and you end up an unsolved manslaughter, you just get to hang out with Jesus even sooner. Peace out! My dad drinks and he hits me. What should I do? Just close your eyes and talk to Jesus. Bruises heal kid. Don't worry. Praying is the same as doing nothing. You might as well just do nothing because praying just won't work. It won't make my Habs any better, that's for sure. Planning trip to Toronto Film Festival. Thoughts..